After eating breakfast in Portland, Oregon last week, I accompanied my nephew, his little brother, and his mom to pre-school. “Does anyone know anything about opera?” I asked the smallish circle of 3, 4, and 5-year-olds. Only a couple of hands went up. During the next 15 minutes, they all tried a little bit of opera singing and acting, they watched me do the same, and they even processed a bit of what they heard and saw. I’m a big fan of catching ‘em while their young. I think they might be too. That night, I went to my brother’s neighbor’s house, the wife of whom incidentally grew up next door to us in St. Louis. Small world. 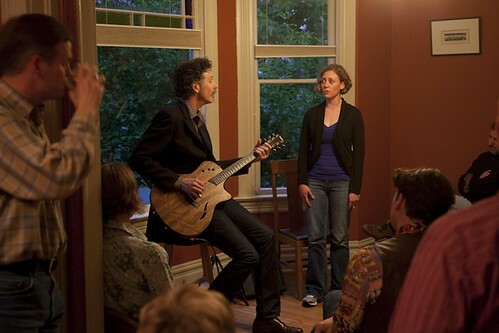 Guitarist, singer, composer, rockstar Walter Parks married one of those beloved next-door neighbors (there was always a smooth path between their house and ours), and he gave his first house concert in his wife’s sister’s living room. He invited me to sing along. “Just improvise some operatic oohs above the melody.” Huh? I wondered what these Portlanders would think. They’re accustomed to hearing folk/songwriter/blues singing (they live in Portland, after all), but operatic oohs, not so much. Turns out, they liked it. I guess it’s good to catch ‘em while they’re older, too.